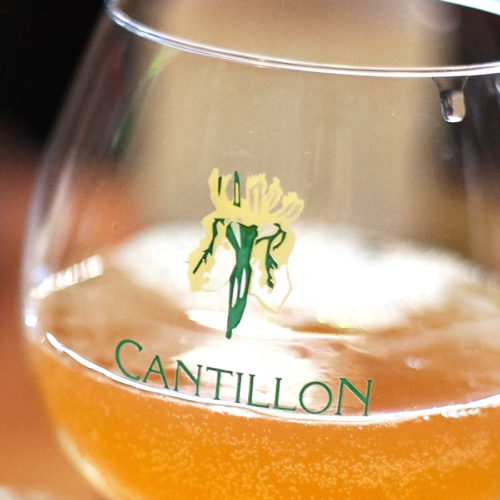 In 2011, master brewer Jean-Pierre Van Roy became the fourth generation owner of Cantillon. Brasserie Cantillon was founded in 1900 and is one of the few traditional breweries still operating in the city of Brussels. Cantillon produces Lambics using traditional ingredients and spontaneous fermentation. Cantillon may be best known for its fruited Lambics, and the Vigneronne is made with wine grapes. In October, time of the grape harvest, Italian muscat grapes are added to a few casks of two-year-old lambic. After three months, the grape-flavored lambic will be blended to create the Cantillon Vigneronne, a rare traditional style, unique to the Cantillon brewery, with a mild white wine grape aroma and flavor. A wine-lovers’ beer! PAIRING ONE: Venison Tartar with Gaufrette potatoes paired with Vigneronne, a Grape Lambic from Brasserie Cantillon. PAIRING TWO: Caramelized Onion Gratin Brûlée’d with Gruyere cheese and Thyme oil and paired with La Trappe Quad from Bierbrouwerij De Koningshoeven. PAIRING ONE: Tuna fusilli, tuna sausage, spicy lemon butter, and rapini paired with Brasserie Cantillon Vigneronne Fruit Lambic. PAIRING TWO: Duck pastrami, a rye crisp, gruyere foam, and beet kraut paired with Yazoo Brewing Company ETF Foudre Noire.